NOT EVERYTHING YOU SEE YOU MUST PURCHASE. : PUMA BY MIHARA!!! 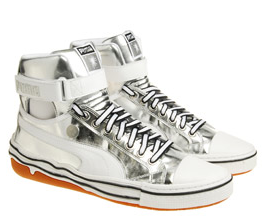 A metallic silver and white high top trainer from ‘Puma by Mihara’. Rubber toe cap. Silver fabric and white leather detail on upper. Black and white laces with adjustable ankle strap, secured with Velcro. Cut out detail on sides of ankle. Silver stud with logo detail on outside edge of shoe. Mihara’s goal is to create footwear that is neither a trainer or a leather shoe. His collaboration with Puma has evolved since it’s launch in 2000, becoming more authentic and original. Wear jeans tucked into these shoes to show them off. 100% leather detailing Rubber sole. 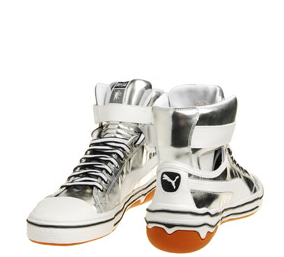 Peep www.brownsfashion.com these kicks are also available at Topshop so I guess there going to be super popular now!